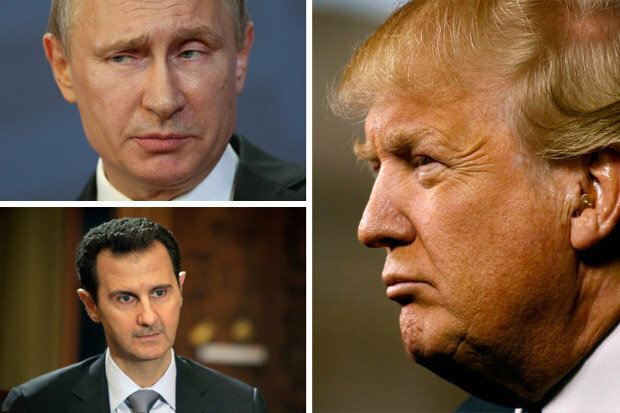 Home El Café Syria: Do you support NATO/Trump or Putin/Assad? Posted about 2 years ago | Comments Off on Syria: Do you support NATO/Trump or Putin/Assad? Last week, Donald Trump gave his executive order to bombard military Syrian bases, after Assad’s army allegedly used sarin gas to kill innocent civilians. The response was immediate from Russia and Iran – especially Russia now unwilling to maintain battle tactic communications with the US after the attack. How to manage the Middle East without using confrontation has become an issue of epic debates and controversy. The Middle East is the biggest headache known to date of modern day geopolitics. Democracy cannot develop in its full potency on the Middle East, and it might never effectively develop considering its violent history. The multilateral cooperation between Russia and the US, is vital for the well-being and stability of the Middle East. Russia is the latest of players to want a piece of the Middle East, but China will likely become another player to dominate the region after their increasing new investments on Iraq, Sudan and Eastern Africa. Islamic Terrorism is a cancer to human development, and it must be eradicated one way or another. Dictatorships and autocratic states can either be beneficial according to the eye of the beholder, or reigns of tyranny and national oppression. It is hard to judge whether or not, dictatorships are justified methods of government considering the constant ultra-sectarian fundamentalist movements engulfing the region. Russia is likely using Ben-Assad’s regime as an excuse to settle in the region, or simply test its military muscle to preview a future confrontation with the west. Indirectly, the US and NATO want to arbitrarily use western politics in the region to impose their reign democratically or else pay the interventionist price of violating international law. Lastly, the native inhabitants dwell by the culture and costumes of sectarian Islam and quite frankly don’t care about foreign invaders — many would rather join Al-Qaeda or ISIS than truce with westerners. 1) Do you support the Trump/NATO crusade or the Putin crusade? 2) Is Trump’s latest intervention policy justified or unjustified? 3) Will the Middle East be split by China, Russia and Iran, if the US ceases to intervene? 4) Why should the US protect and serve the interest of Middle Eastern countries who secretly defame and hate US intervention policy? Shouldn’t Europe take the pie considering they’re more dependent on foreign oil exports from the Middle East and have a larger Muslim integration-population? 5) Anything you want to add? “Yes, I support Trump – NATO intervention in Syria. However, I consider more dangerous North Korea and also the Iran. I also consider that an intervention must to be made indifferent of Russia’s reaction. America is currently the strongest democratic country and must to prove its power. ‘America first’ is not an isolation of America over the rest of the world, but involves American strategic interests and how its defined. It is not clear if Russia or China will be involved in the Syria, but Iran sure will enter and will involve in this conflict. Iran will be the next country who will be attacked by USA; It will be akin the situation of the invasion of Iraq and Afghanistan. The new US administration decided to develop a new strategic target to police Iran and Syria. The serious consequences will be for Israel in this war and how it contains the turmoil from other invading countries to secure its borders. The hidden target of a military intervention in Syria and Iran is the European Union — an underling of European construction in the Middle East. “It remains unclear whether the Trump administration has any well-conceived policy backing up the sending of forceful “messages” such as the cruise missile strike on a Syrian airbase. There is no indication that the president himself has any such strategy in mind. This president’s inclination for making impulsive gestures, including ones involving military force, may well lead to deeper U.S. involvement in the Middle East, even if that is not what policymakers intend or plan today. Basic questions such as how the Syrian civil war can and should be resolved remain unanswered. The United States does not have any more of a stake in many of the rivalries in the Middle East than other powers do, but most other powers have done a better job than the United States of keeping their interests and expenditures of resources in proper perspective. Russia has a major interest in Syria because Syria is where the Russians have their only significant presence in the Middle East. Elsewhere in the region, Russia is relying not on positions on the ground, much less on military intervention, and instead seeks good relations with governments on different sides of regional rivalries, as illustrated by its relationships with both Israel and Iran. “1) Do you support the Trump/NATO crusade or the Putin crusade? A: Yes I support the U.S. action. A: Justified. You cannot sit ideally by and watch continued systematic violence against civilians and not respond as a Democracy. The previous administration was indecisive and allowed the death of tens of thousands of innocents. That’s isn’t a political statement that’s a factual one. A: Yes. They all have a stake in the conflict. China, Russia and Iran benefit financial and strategically from siding with these regimes. I support neither – but if I must my position is closer to Putin. The Middle East is not America or Europe – and thinking the Middle East should be democratic (when the prevailing social system is tribal) is a failure route. Toppling Assad is guaranteed to increase the turmoil in the Middle East and possibly create another Libya. I hope Trump is not stupid – hopefully what I do not know would alter my perceptions. I have lived almost half my life in the Middle East. I repeat, the Middle East is tribal and no country will ever “control” this region. However, if a country acts like a big brother (like Russia) which supports a government – they will gain some “control”. Diplomacy requires both idealism and pragmatism. The USA leans to heavy on idealism which is a mistake. Yes, the enemy of my enemy is my friend. Europe is in no position to do anything in the Middle East as the EU is a zombie in the area of foreign policy. This is too general a question for such a complex situation. I find it hard to support anything Putin does or wants to do. Putin’s motives are all self-serving and not intended to help the US. The US must force NATO to step up to its intended role—and NATO countries to spend their fair share (2% of GDP) of the defense bill—especially, above all— Germany. Justified…and long past due…but only as a gesture, not as a long range solution. Obama had neither the guts nor the will to step up to anything where he couldn’t blame the outcome on someone else if it went badly. Trump needs to show the world that when countries’ leaders do bad things, there will be some kind of consequences, short of outright war. Probably so, but it is a divided mess no matter who intervene. Nobody can fix the Middle East. All the US can do is intercede to choose who it supports and who it opposes—and that is not always clear. “Merely to contemplate our policy in Iran since WWII, beginning with our CIA joining British operatives in covert overthrow of the democratically election Mossadegh government in 1953, and return the Shah Pahlavi to the Peacock throne, is to sail to sea with no compass. Libertarians, pointing to contract law, say: British Petroleum made a 100-year contract for all Iran’s oil; Mossadegh violated the contract. But one shah for personal remuneration sold away Iran’s natural resources for 100 years; is that a “contract” with Iran? And Cold Warriors say, no, no the reason “we” overthrew Iran’s first democratic government is clear. This was 1953. All around the world newly fashioned democratic governments were entering into electoral alliances with their local Soviet-backed communist party. And so, in Iran, the involvement of the Iranian Soviet Tudeh Party with the Mossadegh government. Picture it. The Persian Gulf, bordered by Iran, and on Iran’s northern border, the stalinist Soviet Union rapacious for world conquest. The Tudeh elements take over the Mossadegh government and the one, single most important Middle Eastern strategic goal of the United States–to keep the Soviet Union out of the Middle East–spectacularly collapses with the Red Army streaming down from the north at the “invitation” of the democratically elected government of Iran–as now taken over by the Tudeh element. And so, the first democratically elected government in the Middle East’s most powerful nation is overthrown and the dictatorship of the Pahlavi’s is returned to power. And from 1953 until 1979, this works rather well. The Shah remains our man. He works hard to suppress the mullahs, to create a secular society; and so he does. When the Middle East is united against Israel, the Shah, for “us,” is Israel’s friend. He is an authoritarian, yes; his secret police, SAVAK, established with U.S. guidance, seize, torture, kill political opponents. But, if you are in Iran and stay out of politics, you are free to be prosperous and happy. Just don’t interfere in politics and the future of your country. Then, leading up to 1979, U.S. President Jimmy Carter decides that the U.S. must live up to its moral obligations. That means, in the Middle East and elsewhere, to stop supporting authoritarian governments and let the will of the people prevail. The Shah in Iran has gotten into trouble by a grand plan of social engineering to change agricultural policy; the effect is to drive millions of young rural (read: orthodox religious) Iranians off the land and to the cities. There, a relatively poor, unemployed, restless mass, they turn for guidance, as they were taught, to the mullahs. They are the mobs that turn against the Shah, against his “secularized” Iran, to storm Tehran in favor of the the hero of fundamentalist restoration of Islam in Iran, after decades of secularization by the Shah. They are in the streets driving out the Shah and crying for the Ayatollah Komeini. Carter refused to back the Shah diplomatically and militarily against “the people.” Seeing his great supporter and protector defect, the Shah, too, defects, flying from Iran. The Ayatollah Komeini flies in. The mobs go wild with delight. And, as hard as Jimmy tried, we have not democracy but mob support for the fundamentalist Shiite theocracy of Koeini. We have the resurgence of pure barbarian standards as our diplomats are seized and imprisoned, brutalized, by Iran. It is a clear, indisputable, classic causa belli. But nothing can cause the belly of Jimmy Carter to use the military. So we had 26 nice years of the Shah, but now have had 38 years of Shiite fundamentalism in Iran, bitterly hostile to the United States, using semi-secret proxies to spread Shiite fundamentalism, often by means of terrorism, through the Middle East. We have a mighty Middle Eastern country dedicated to the destruction of Israel. And that country, with a long, long history of Western intervention to get its oil, to shape its politics, is striving for the one sure protection against such intervention: nuclear weapons. Our great spiritual ally in the Middle East, Israel, will do anything to stop Iran from obtaining nuclear weapons. And Israel is right. Its only final security is to be the only nation in the Middle East with nuclear weapons. One U.S. President Barrack Obama, seen by some as a Jimmy Carter figure, declined to initiate any new U.S. military intervention in the Middle East for eight years. There are good arguments, for that, after our experience in Afghanistan and Iraq. And Mr. Obama did bring the world’s powers together to reach an agreement with Iran on nuclear weapons. The United States did not reach an agreement; ALL the world’s great power reached an agreement. It can and will be enforced. Iran is under an incredibly bright spotlight. Even Israel may live with that agreement as long as we enforce it. But the U.S. has a pattern in the Middle East: restrain, then lunge, then restrain. Carter was a restrainer. The Bushes was a lungers. Obama was a restrainer. Trump seems to be a lunger. Who has done better, the restrainers or the lungers? On the diplomatic front, the new Turkey-Russia-Iran alliance threatens to marginalise other outside actors.” Whereas the Trump administration’s current action in Syria shows a hawkish US’s paradigm in the region. The latest incident, which comes at a very odd time – just days after the White House it will no longer pursue the ouster of Assad, cementing the Syrian leader’s resolve not to do anything to infuriate the US administration – means Trump is faced with the same dilemma that faced his predecessor: whether to openly challenge Moscow and risk deep involvement in a Middle East war by seeking to punish Assad for using banned weapons, or compromise and accept the Syrian leader remaining in power at the risk of looking weak. A-2: As for Trump’s intervention doctrine, I would like to solicit the point of view that this trump-fostered intervention may not be justifiable since this kind of Monro doctrine sow seeds of hatred and antagonism in the heart and minds of the local inhabitants, the ARABS. To counter- examine this hypothesis, we can go back to the annals of war history and richly get the information that these kinds of western interventions, particularly in the post Cold War era have produced no positive results. But it is unfortunate that Hawkish Republican Sens. John McCain and Lindsey Graham are pressing the Trump administration to escalate military efforts to protect the Syrian people against President Bashar Assad. “As part of a broader strategy, we urge the President to take greater military action to achieve our objectives, including grounding the Syrian air force and establishing safe havens inside Syria to protect Syrians,” the senators said in a joint statement on last Tuesday. Apparently for the last few decades in the Middle East, the policy of western powers — led by the United States — has been to ensure the flow of oil; maintain stable and secure allies like Turkey, Saudi Arabia, Jordan, the Gulf States, Egypt, and Israel; and maintain military and economic influence when needed. But in reality to meet these ends the US administrations have committed some blunders, thereby making the region towards dismemberment. And if the Trump’s administration would not learn from the past mistakes, it would be an irony for both America and the people in the Middle east. A-3: it goes without saying that today Middle east is a hot bed of tug between multilateral stake holders. This is not a middle east representing an era of bipolarity once experienced during the years of the Cold War period. Today, Middle east seems to depict a clash between the centripetal and centrifugal forces. The nature of clash is multi-complex. Though presently, Syria is the nucleus of the conflict yet not resolved with prudence and political or diplomatic sagacity, the crisis may entrap the whole middle east. Although Russian-Iranian bilateral are complicated, one thing is clear: Iran has proven to be an asset for Russia in Syria and acts as a hedge against Saudi Arabia. Saudi Arabia and the Middle East region remain key suppliers of natural oil and gas to the People’s Republic. But after 2011, when China lost millions in the likes of war-torn Libya and Syria, it began to pen a slew of deals with alternative providers, particularly in North America. China conducted its first joint counterterrorism drills with Saudi Arabia in the southern Chinese city of Chongqing. It’s been doing the same with other Muslim-majority Asian nations — mostly members of the Shanghai Cooperation Organization — over the past few years. Arab politicos and intellectuals have long decried a precarious U.S.-Arab partnership, premised disproportionately on just two things: Ever-fluctuating oil prices and the ebb-and-flow of counterterrorism. China promised more than that. Since 2013, Beijing had championed its “One Belt, One Road” (一带一路）policy of promoting trade with historical Silk Road trade partners in faraway West Asia. But the rousing slogan hasn’t been met with much innovation in China’s trade agenda. A-4: Yes it is correct to say that US must not indulge into the Middle east via a military war. And of course, the European Union diplomacy must be active to resolve the ongoing crisis. France has got deep influence in the ARAB lands. Despite the fact that Britain has left the EU, the British diplomacy may also be of paramount consideration to use its leverage in the said crisis. Germany may also play an instrumental role in engaging itself with the Arab counterparts. Although Europe and the United States have regularly competed for influence in the Middle East, the EU’s growing weight in the region, instead of fueling a new transatlantic face-off, has in fact contributed to improving relations. The EU needs to adjust to the new geopolitical landscape created by the Syrian conflict by recalibrating its position vis-à-vis other major players, contributing to regional security issues, and standing firm on its values. It needs to use its large foreign policy toolbox in a much better-coordinated manner under the leadership of its foreign policy high representative. A: First of all, the “Crusade” is a very sensitive word here in the Middle East, and people would laugh if you’d say publicly “Russian crusade”. Crusade were some of the first expansionist and imperialist expeditions conducted by Western/European powers. They were bigoted in religious and racial terms. They still are. And they are still deadly affairs coming from the West: predominately the US and Europe. I frankly do not support any “crusades”, and I see Russia as a defender of a sovereign Arab country which is under the savage attack from the US/NATO, and by the terrorist groups (called sometimes “opposition” by the Western press) sponsored by the West. A: By what could it be justified? Unjustified, of course. A: When was the Middle East split by anybody else, except by the Europeans and the US? China, Russia and Iran would always find a way how to bring prosperity and independence to the Middle East, while respecting the local culture, if the West would miraculously withdraw from here. After the last 100 years of the British and US “involvement”, there is hardly anything left of the Middle East. Anyone who worked intensively in Iraq, Syria, Palestine, or even Lebanon knows perfectly well that the region had been broken, ruined and played with unceremoniously, from Washington and London. I don’t understand the question. Is it seriously suggesting that the “US protects and serves the interests of the Middle East?” And, should Europe which tormented and robbed this part of the world take over the plunder again? Perhaps, forgive me but just “perhaps”, shouldn’t the people of the Middle East be asked whether they want to be “protected” by the West? The technological superiority of Western civilization endowed Westerners with a dangerous, indeed criminal conviction that the Western rationalism and the Western model of society are the best and should be emulated by others. To me, such approach is arrogant and doomed to fail because it ignores the complexity of concrete historical and geographical circumstances and the richness of civilizational diversity that they produced. The same technological superiority allowed Westerners to colonize the world, to impose the colonial administration, and to plunder the land and people of colonies. The richness of the Western world comes to a large extent from the colonialist looting of technologically less developed nations. The political and economic configurations of the world we live in today are the product of European colonialism. And although the former colonies are now de jure free and independent, they remain an economic appendage of the former colonial powers, providing natural resources and cheap labor to transnational capital. And the Western complex of superiority still defines the foreign policy of Americans and their loyal Western allies. Politics are an expression of economic interests. This essential truth is often masked by sanctimonious moralizing of Western politicians on the violation of human rights in non-Western countries and the outrage over the ‘dictatorship’ of forms of government that do not follow the liberal model of democracy. Economic interests drive political actions. All the wars in the Middle East, which the United States and their allies conducted or sponsored in the past and are conducting at present, is about securing a stable access to oil and gas, the main source of our comfortable living in the West. The West’s policy in the Middle East is a complex nod of political, economic, and moral reasons. To understand West’s actions in this region, one has to look into the interplay of these reasons, not just isolating economic interests, for example. Looking at American foreign politics solely through the perspective of energy resources will fail to take into account one of the most powerful motivations – the genuine belief of American politicians in the superiority of the American democracy and the desire to export it to the non-Western world. However, because of the incapacity, inability, or unwillingness to understand the Other, this desire has led to disastrous results in Iraq, Libya, Syria, Ukraine. Democracy cannot be imposed. It is an oxymoron. Democracy presupposes the free will of people. If democracy is forced upon people through predatory internationals loans which require the destructive economic reforms or through bombings of cities and villages, this is not a democracy. This is a neoliberal imperial interventionism. Democracy can only be developed through education and empowerment of ordinary citizens. But this requires years and years of painstaking work, patience, humility, and love, which hold no market value, whereas loans and weapons bring huge profits. It is exactly the interventionist policies of Western powers that stirred the storm in the Middle East. Driven by their arrogant ignorance of the complexity of the region and the economic interests in oil and gas, the US attacked Iraq using a blatant lie as a pretext. I will never forget General Colin Powell with a test tube which allegedly was a proof of Saddam Hussein’s arsenals of chemical weapons. After the invasion, hundreds of thousands of deaths, destroyed infrastructure, the emergence of ISIS, Americans were never able to produce one convincing proof of their claims in the UN Security Council. It turned out to be one big criminal lie. I do not think that Russians want a piece of the slice in the Middle East. For one simple reason – they have enough oil and gas. I think Russians had enough of Western arrogance and catastrophic interventionism. They want to prevent the destruction of Syria and an enormous cataclysm which would lead, over again, to millions of refugees, to the emergence of terrorist groups, and to the utterly impotent Western reaction to it. Both Russian President Vladimir Putin and the Minister of Foreign Affairs Sergei Lavrov have repeatedly stated that the regime change in Syria should be decided by the Syrian people, through a democratic election, not through the external powers’ handpicking of their favorite as the new president. Russians are interested in maintaining peace in Syria. And they did not invade Syria like Americans did in Iraq. They did not send massive troops on the ground. They came on the invitation of the Syrian President. I find Trump’s decision to bomb Syrian army under the false pretext that it launched a chemical attack against civilians impulsive and irresponsible. First of all, the chemical weapons that Assad regime possessed was destroyed in 2013 under the supervision of UN experts. Russians played a key role in convincing Assad to do it. So the version that Syrian army launched that attack in Idlib province of Syria is highly improbable. Americans jumped at that conclusion hours after the attack happened, and without any serious investigation declared that it was the terrible crime committed by the bloody regime. The news about that attack made the headlines of all Western MSM, while a more deadly and terrible crime by Syrian ‘opposition’ suicide bombers, who attacked buses with civilians, women, and children in western Syria villages, did not receive such a full coverage. It is yet another example of the ideologically eschewed bias of Western MSM who readily talk for hours about alleged crimes of the regime and do not mention the gross violations of human rights by the so-called Syrian opposition. It is difficult to accept facts that do not inscribe into the well-established framing of the world, in which the all-powerful West dictates the rules of the game, appoints and takes down heads of the states that cannot oppose the West, designates villains and destroys them. It is difficult to accept for the American elites that the world is becoming multipolar and that they are losing their grip on it. Americans are going through a deep and fundamental identity crisis, triggered by the realization that they are not anymore the only superpower that decides the destinies of the world. American imperialism as the foundation of American identity has been challenged by emerging alternative centers of power, such as BRICS. It is a very painful process, but Americans have to go through it if we are to live in a safer, more democratic world. After all, democracy is about pluralism, equality, and the respect of differences. It is about a peaceful resolution of conflicts where one genuinely tries to understand the Other, without bullying or aggressing the opponent. We would all benefit from a diversity of various forms of governments and cultures, not just the dictatorship of false neoliberal democracy, imposed on technologically weaker countries through predatory loans or criminal bombings. “I don’t support Donald Trump on this particular issue and I think it’s a very unwise move to attack Assad – a starch defender of religious minorities in the region, as he himself is an Alawite. When Trump ran for office a few months ago, one of his noticeable campaign promises was to stay away from bullying Assad’s regime – a promise not shared by his archrival Hillary Clinton who promoted a neo-conservative scheme to straighten the mess she help create. There is only one reason why western countries intervene in Middle Eastern affairs, and has nothing to do with friendships or democracy; unlike the past where the Middle East was a schoolyard for religious control, as we approach a post-religious era, it is all about petro-money. Thus the reason why Trump’s first interventionist move sparked in Syria and not Ukraine, which continues under the direct siege of Russian military forces masked on civilian uniforms protected under Putin’s umbrella. I strongly suspect, countries like Taiwan and Israel will not be secured from China, Russia and Iran in the near future, if the United States loses military grip globally as it did during Obama’s administration. Dealing with the Middle East is like dealing with an immovable object – if you cannot move something, then you must blow it up (I don’t mean blowing the Middle East, but sectarian violence). No country has ever seeded democracy on the Middle East and succeeded in reforming the region. Only one empire was 100 percent successful in quenching all the havoc on the region; the Mongol Empire on their quest to harvest the region without tare dealt brutally with sectarian violence to try to prove a point to all surrounding nations after suffering Islamic extremism of its own. If the west wants to police the Middle East and deal with ISIS once and for all, it must adopt a ‘neo-mongolist’ attitude in the region to weed-out sectarian tare, otherwise it is completely ridiculous and irrational to believe Western Democracy will solve the conflict with its current international model. The reason why Russia is in Syria is because it knows it can control the problem with force and gain territory and political alliance with autocratic leaderships proven to work in the region. The generals fighting the counterinsurgency in Libya and Egypt have his support, and don’t trust neither NATO nor the US. I don’t like Putin as he is the epitome of fake news and anti-journalism; however, the ousting of dictators in the Middle East was one of the most stupid and destructive events to engulf the Middle East in many decades, perhaps centuries – and it wasn’t created by Putin’s neo-soviet mentally to expand militarily worldwide, but by US interventionism. The US has completely torn the Middle East from the inside out. The US attacked Afghanistan and Iraq, but not main Islamist donor states like Saudi Arabia, Qatar and Kuwait to name a few? Geopolitical democracy is as joke, and I learned all I needed to learn of democracy after watching how the western world dealt with Rwanda. The US is simply ‘jealous’ Russia decided to intervene in the Middle East. The US threw the toy away with its conflictive policy in Syria and now wants it back as soon as the ‘new kid’ in town arrived. The Russian’s despite their imperialistic agenda, did not launch airstrikes against Iraq when US forces were illegally present in the area. The US reaction against Russia and especially against Assad is completely unjustified. The truth is Syria is a complete fiasco and either the Kurdish, the Turks, Assad’s Regime, ISIS or Russia will control the region – the truth might be the same in Libya and possibly in Afghanistan in the near future as China ventures closer to Baluchistan. The US now feels protective of human rights, not because it cares for the Syrians, but to tell Russia not stretch its arm to expand in the area — the chemical weapons in only an excuse to spank Russia. Trump is only going to aggravate the problem in Ukraine, as Sergey Shoygu — the Russian minister of defense — will push Putin to not give up the notion of ‘Russian empire’ and its inspirations to counter US interventionism. China watches the situation and would love for the US and Russia to annihilate each-other in the region while it expands. A lot of experts claim the relationship of Russia and China is great based on their latest energy agreement – I beg to differ, just wait till China and Russia’s interest clashes on Euro-Asia or the Middle East, as they both expand outwards to challenge US supremacy.